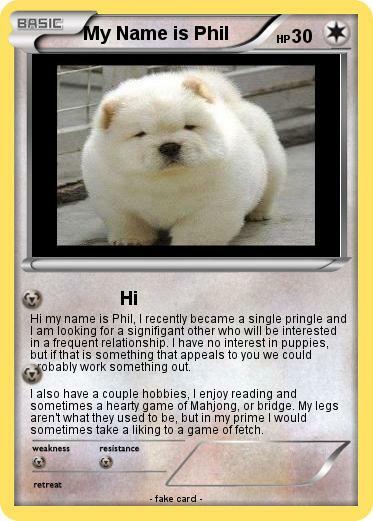 Hi my name is Phil, I recently became a single pringle and I am looking for a signifigant other who will be interested in a frequent relationship. I have no interest in puppies, but if that is something that appeals to you we could probably work something out. I also have a couple hobbies, I enjoy reading and sometimes a hearty game of Mahjong, or bridge. My legs aren't what they used to be, but in my prime I would sometimes take a liking to a game of fetch.